Add a pop of cheer to a dreary, cold day. 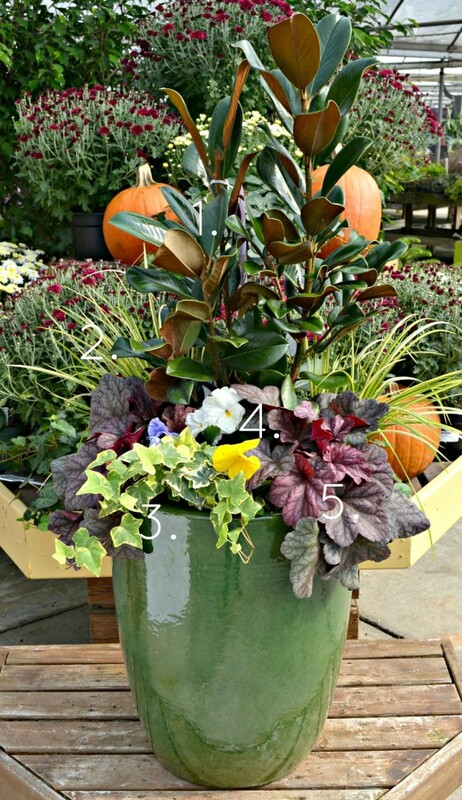 Follow these container recipes using interesting evergreens, hardy perennials and cool season annuals to create a unique container garden that can provide color through the cold. Evergreen trees and shrubs are a great addition to a container garden and can be enjoyed for multiple seasons before needing to be transplanted into the ground to allow for ample root growth. Mature sizes listed refer to growth habits when planted in the landscape. 1. Mahonia ‘Soft Caress’ – A low growing evergreen shrub with unique texture that produces bright yellow flowers in early winter. This shrub prefers shade and matures to just 3 feet high and wide in the landscape. 2. Heuchera ‘Electra’ – An evergreen, hardy perennial with bright chartreuse foliage and deep pink veination. 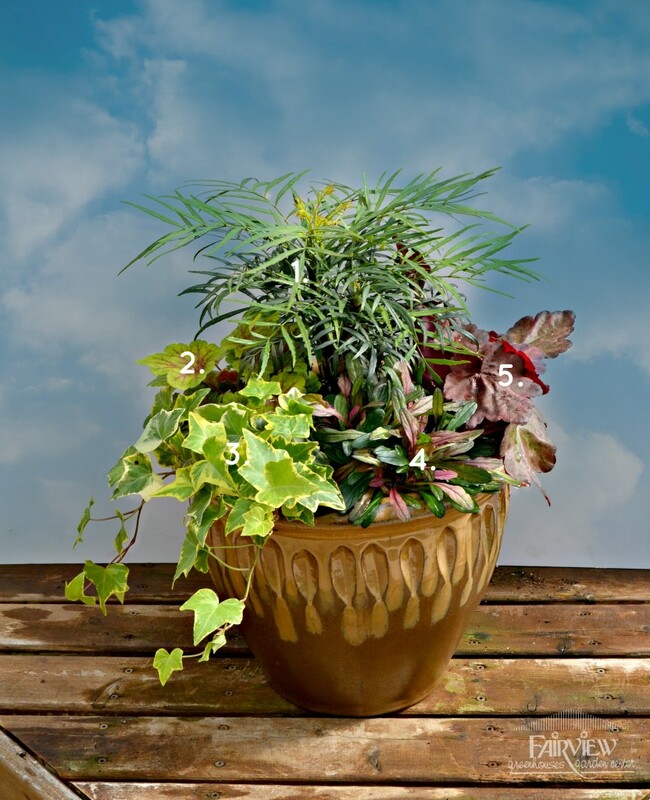 Prefers shade and matures to 8″ tall and 14″ wide in the landscape. 3. Variegated Ivy – A fast growing evergreen vine with distinctive leaves. Prefers moderately moist soil and tolerates shade or bright light. 4. Dixie Chip Ajuga/Bugleweed – An evergreen perennial that is slow growing. Prefers shade to part shade and matures to just 3″ tall by about 6″ wide. 4. Heuchera ‘Autumn Leaves’ – An evergreen, hardy shade perennial with deep pink to purple foliage. Only matures to 8″ tall by 15″ wide. 1. Teddy Bear Magnolia – An upright evergreen tree. It’s compact, deep green leaves have velvety-brown undersides. A moderate growing Magnolia maturing at 10-16 feet in the landscape. Large white flowers appear in summer. 2. Acorus ‘Ogon’ – An evergreen groundcover grass that grows 6-10″ tall and prefers sun to partial shade. 3. Variegated Ivy – A fast growing evergreen vine with distinctive leaves. Prefers moderately moist soil and bright light. 4. 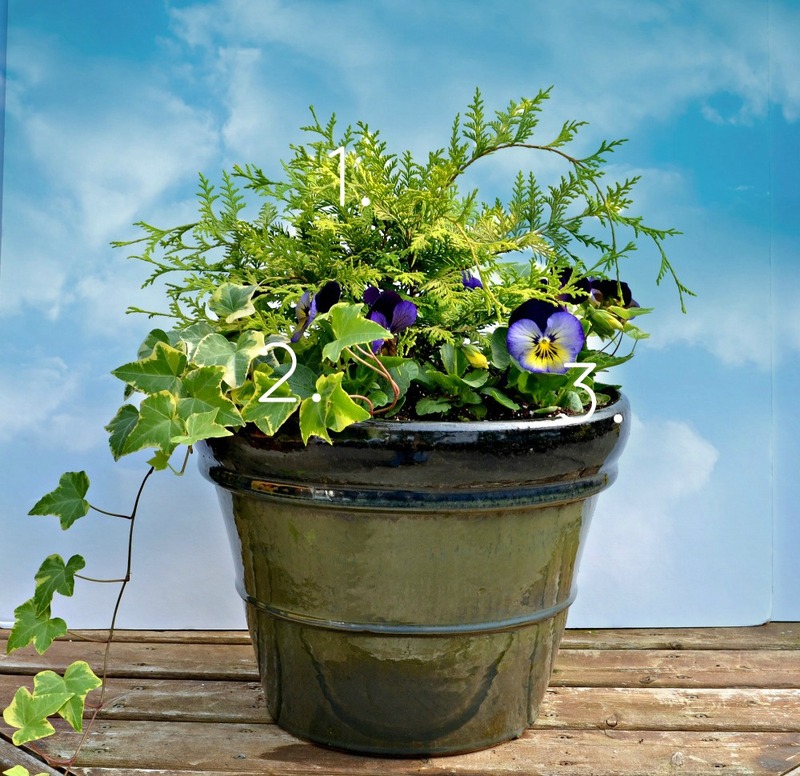 Pansy Delta Pure Colors Formula Mix – A variety of solid face pansy colors with large, abundant blooms. 5. Heuchera ‘Berry Smoothie’ – A moderate growing evergreen hardy perennial that prefers part shade to shade and matures at 18″ tall and 20″ wide in the landscape. 1. Rumex/Bloody Dock – A cold hardy, perennial with uniquely-veined leaves that prefers full sun and can grow 12-26″ tall. 2. Pansy Karma Copperfield – A copper and gold colored cold hardy annual with large, abundant blooms. Full to part sun. 4. Carex ‘Toffee Twist’ – An upright cold hardy annual grass that prefers full to part sun and can grow 18-24″ tall. 5. Celosia/Cockscomb – A unique early fall annual with soft, brain-shaped flowers. Will not tolerate severely cold or below freezing temperatures. 6. 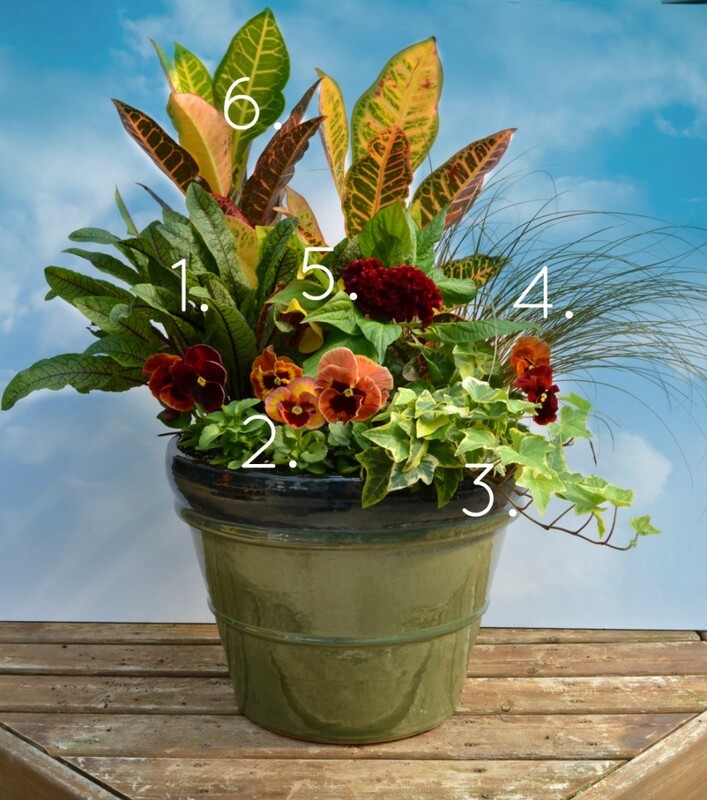 Croton – A brightly colored foliage plant known for its rainbow, leathery leaves. Prefers part sun to part shade and moist soil. Will not tolerate severely cold temperatures. 1. Vintage Gold Chamaecyparis – A slow growing evergreen shrub that prefers full to part sun. Can mature to 5-6 feet tall in the landscape. 2. Variegated Ivy – A fast growing evergreen vine with distinctive leaves. Prefers moderately moist soil and bright light. 3. Pansy Matix Midnight Glow – A cold hardy annual flower with abundant large flowers. Prefers sun to part sun. 1. 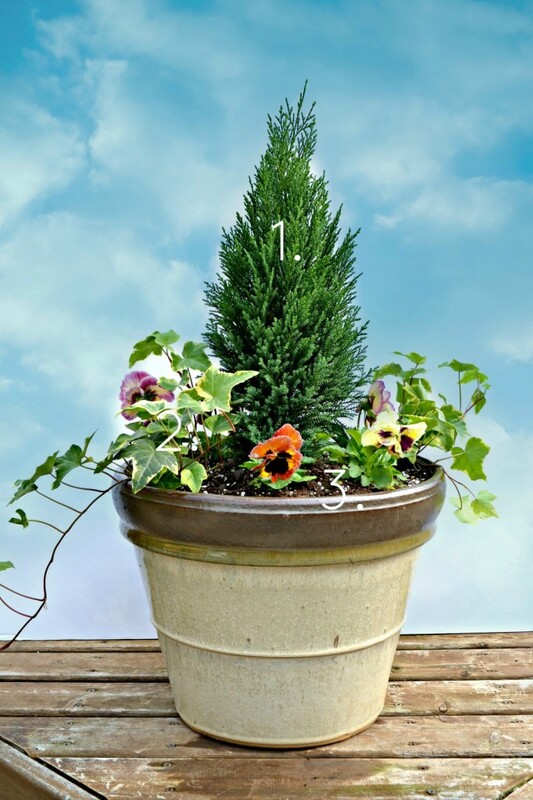 ‘Shorty’ Leyland Cypress – A slow growing evergreen tree that prefers full to part sun. Can mature to 5-7 feet in the landscape. 3. Pansy Colossus Rose Medley – A cold hardy annual flower with abundant large flowers. Prefers sun to part sun. 1. Variegated Acorus/Sweet Flag – An evergreen perennial with striking grass like foliage. 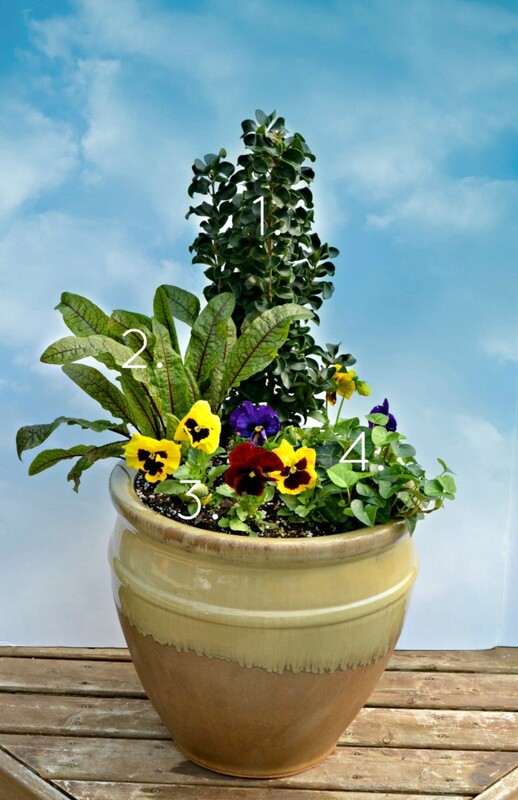 Grows to 12″ tall, prefers moist soil and can tolerate sun or shade. 2. Snapdragon Twinny Mix – A unique double flowered snapdragon with multiple colors and a compact growth habit. 3. ‘Redbor’ Kale – An ornamental fall favorite with curled leaves that turn red as they mature in cool weather. 4. Viola Penny Denim Jump-Up – A neat and compact cool season annual with prolific purplish-blue flowers. 5. Variegated Ivy – A fast growing evergreen vine with distinctive leaves. Prefers moderately moist soil and bright light. 1. Curly Leaf Ligustrum (Ligustrum japonicum ‘Coriaceum’) – A slow growing, upright evergreen shrub. Can mature to a height of 36-60″ tall and prefers sun to part sun. 2. Rumex/Bloody Dock – A cold hardy, perennial with uniquely-veined leaves that prefers full sun and can grow 12-26″ tall. 3. Pansy Collosus Blotch Mix – A cold hardy annual flower with abundant large flowers that have dark red or purple “blotched” centers. Prefers sun to part sun. 4. 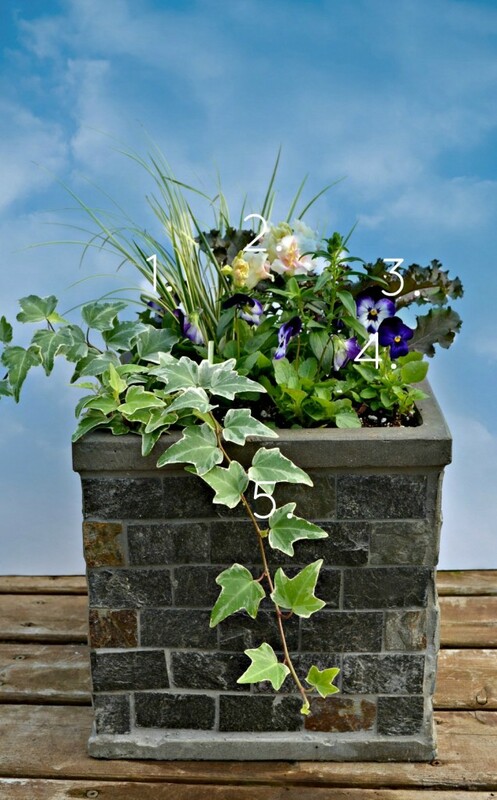 Ivy – A moderate growing evergreen vine that prefers part shade.